From Prescott or Prescott Valley, take Hwy 69 south towards Dewey. In approximately 6 miles from Prescott Valley, you will find us located on the East side of the highway across the street from the Chevron station. From I 17, take Prescott exit onto Hwy 69 and go north approximately 20 miles (1 mile past Hwy 169) to the Kachina Place stop light. We are on the right side of the highway, across the street from the Chevron station. 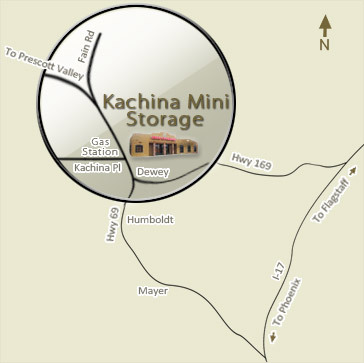 © 2018 Kachina Mini Storage. All Rights Reserved.